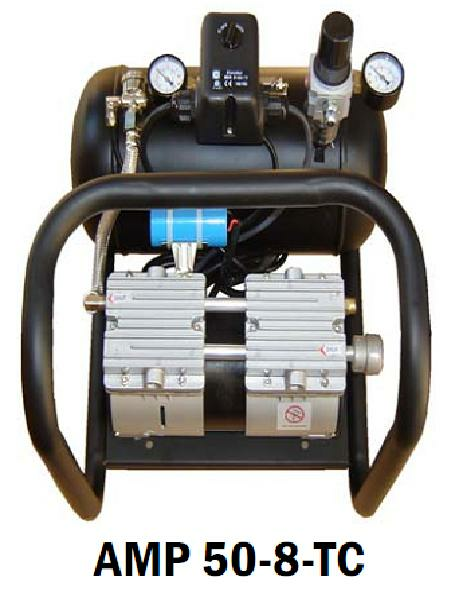 An Italian made compressor unit designed and engineered for expert air brush paint application results. A superior air brush ready unit designed and engineered for optimal, noiseless paint application. Engineered for sustained performance, the Silentaire AMP 50-8-TC Ultra-Quiet Compressor is a professional air brush artist’s solution to perfect paint application. Portable, and easy to use, the AMP 50-8-TC air compressor eliminates the risk of environmental noise during work on a project. The Silentaire AMP 50-8-TC Ultra-Quiet Compressor is unparalleled in quality and design. Manufactured for low maintenance care, the AMP 50-8-TC offers an artist precision without the hassle of oiling. 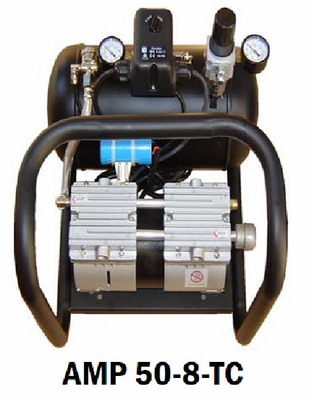 Outfitted with a clean air system, the AMP 50-8-TC compressor does not require continuous clearing. Equipped with an air tank, pressure regulator, tank pressure gauge line pressure gauge with built-in moisture trap, and safety valve, the unit also comes with an air intake filter and engine cooling fan. In 110Volt/60Hz, as well as 220volt/60Hz and 220volt/50Hz voltage units. When air brush artists seek perfect paint application they look to Silentaire Ultra-Quiet Compressors. Designed and manufactured to provide hours of continuous pressure to air brush projects - the ultimate in expert paint application. Silentaire compressors offer excellent air brush performance to professionals demanding the most from an air compressor, the AMP 50-8-TC Ultra-Quiet Compressor is one of the most reliable clean air systems sold direct to artists. Comes outfitted with an air tank, pressure regulator, tank and line pressure gauges, safety valve, and built-in moisture trap. The unit also includes an air intake filter and engine cooling source. Oilless and low maintenance, unparalleled in quality and results.